If there was one thing that the original Aurora Plastic Company of Hempstead, Long Island, was famous for, it was monster figures. Other companies may have done figure kits, some may have had similar subjects, but it was Aurora that became synonymous with these creatures of the night. The original Aurora company is long gone - as dead as most of its monsters - and as long ago as 1976, most of the tooling that survived was acquired by Monogram. But Aurora certainly hasn’t been forgotten. And to this end, enthusiasts Dennis Vincent and Cortlandt Hull bring you ‘The Aurora Monsters’ - the DVD. With extras, this provides two hours of stories and interviews with people associated with creating the Aurora monster legend, all hosted by Zacherley the Cool Ghoul, with Gorgo the Gargoyle. To UK TV viewers, Zacherley’s name will almost certainly be unfamiliar, but in the US, particularly in earlier years, his was the face that introduced all those old Universal movies that are now found on TV, and in many ways more famous than the movies themselves. The Zacherley-Gorgo duo introduces the main DVD, then - by Gorgo supposedly finding and running some old film stock - this leads into the interviews. These include my old friend Andy Yanchus in New York, who was Project Developer for Aurora, and worked on, if not the original figure series, certainly the later Monster Scenes. 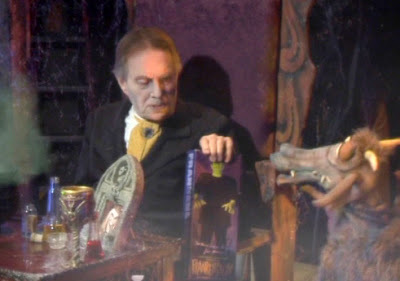 On the DVD, Andy regales you with stories of how Aurora got into terrible trouble with parental groups, who assumed all this monster mayhem was injuring their little darlings. Mind you, ask the kids, and it was the opposite view - they loved it all! 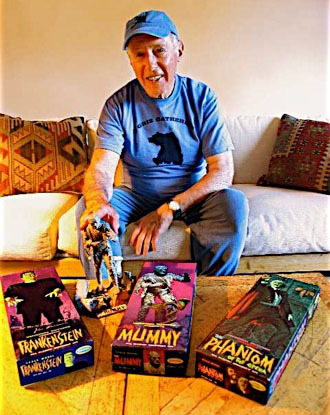 Also present on the DVD is one of the most famous box-art illustrators ever, James Bama, who did all the monster boxes for Aurora, some again for reissues. 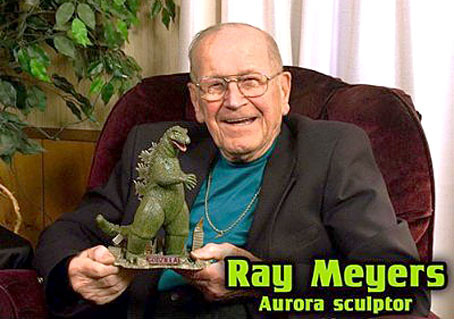 Then there is Ray Meyers, who was one of the original sculptors for the company and managed to get incredible likenesses of actors who portrayed the movie monsters. 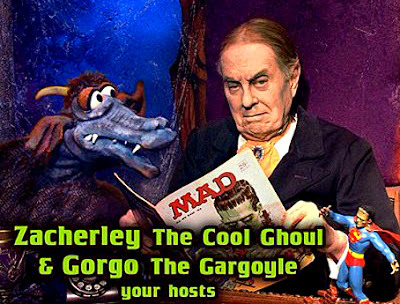 The interjections of Zacherley and Gorgo is a bit of an acquired taste, Gorgo coming across at times like the Muppet Kermit the Frog on speed, but the spooky setting looks effective, considering it must have been done on an incredible tight budget . Aurora may have gone, but new companies have taken over much of the catalogue. Some are ‘garage’ outfits (ie specialist) Sideshow Collectibles, while others use traditional injection-plastic techniques. They lease old tooling from Revell-Monogram, retro-engineer original kits, cut new tooling from original parts, or create brand-new kits ‘in the Aurora style’. 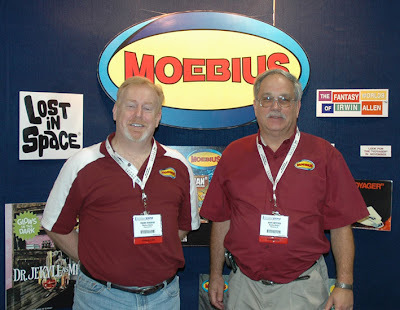 Two of these companies, Polar Lights and Moebius Models are mentioned on the DVD (the other is Monarch Models), with the Moebius CEO Frank Winspur interviewed. The YouTube clip above is from the DVD; thanks to Andy Yanchus for the review disc. Visit the DVD website here. Have a look at a range of monster and fantasy stuff here. 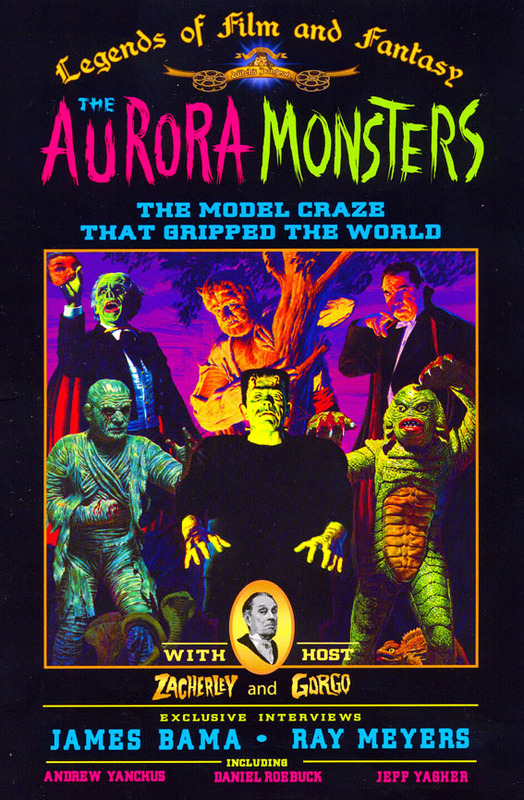 1 DVD cover, featuring six of Aurora’s most famous monsters: Phantom of the Opera, Wolfman, Dracula, The Mummy, Frankenstein, Creature from the Black Lagoon. 2-3 DVD frame grab and publicity still of Zacherley and Gorgo. Note the Aurora Frankenstein box. 6 Frank Winspur (left) and David Metzner of Moebius Models.